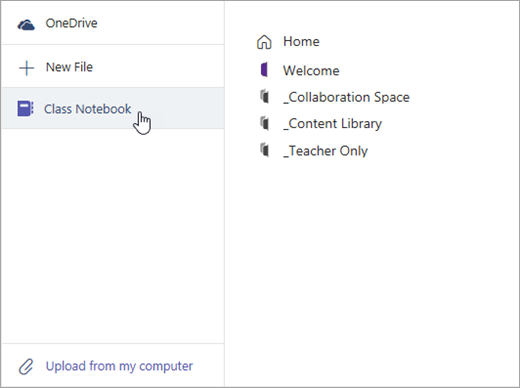 Every class team comes with its own linked OneNote Class Notebook. Your Class Notebook is a digital notebook for the whole class to store text, images, handwritten notes, attachments, links, voice, video, and more. Student Notebooks -- a private space shared between the teacher and each individual student. Teachers can access every student notebook, while students can only see their own. Content Library -- a read-only space where teachers can share handouts with students. Collaboration Space -- a space where everyone in your class can share, organize, and collaborate. The Class Notebook in the General channel is the central location for viewing and interacting with the Content Library, Collaboration Space, and each student's private space. If you haven’t set up your Class Notebook yet, you’ll be guided through the right steps the first time you visit the Class Notebook tab. Navigate to the General channel under the desired classroom, then select the Class Notebook tab. Add or edit pages using the expandable menu at the left side of your notebook. Each time you create a new channel in a class team, a new section is automatically created in the Class Notebook’s Collaboration Space. All students and teachers can edit and work on OneNote pages within a channel. Navigate to a class team, then select a channel. Expand the Class Notebook tab to a bigger size by selecting the Expansion icon (diagonal, double sided arrow). Manage your Class Notebook settings by navigating to your notebook in Teams, then selecting the Class Notebook tab > Manage Notebooks. Note: To create separate Collaboration Space permissions in your Class Notebook, follow these steps. All the Class Notebooks you've created in Microsoft Teams will be listed under your Co-owned notebooks. Add the page to your notebook's Content Library or Collaboration Space. Then, navigate to the Assignments tab and select the New assignment button. Fill out the details for your assignment and select +Add resources. In the box that opens, select Class Notebook and navigate through your notebook's sections to choose the page you'd like to assign. Choose the section of your students' notebooks you'd like the page distributed to. For example: Handouts. Select Assign when you're finished. Each student will now have a copy of the page inside their Class Notebooks. They can also open and edit the page directly from the assignment card in Microsoft Teams. Note: Check to see which version of OneNote students are using before creating your assignment. Using these versions of OneNote ensures that notebook pages you assign will lock and prevent students from editing them after the assignment's due date passes. The student's page will lock when they Turn in the assignment, but unlock when you Return an assignment or they select Undo turn in. Open the assignment and select the Review button. Then, select a Class Notebook page your student has turned in under Student work to open and review it in full-screen mode. To add feedback to a student's OneNote page, select Edit in OneNote Online. Your changes will save automatically. Within Microsoft Teams, you can interact with Class Notebook by visiting its tab in the General channel. If you'd like to create and review assignments while within OneNote and then sync these back to your class in Teams, do so by following these steps. Connecting your Class Notebooks with classes lets you move back and forth even more seamlessly between your apps. This is also a good option if you're already working from a Class Notebook that you didn't create in Microsoft Teams but would like to use for a class. Select Open in OneNote to launch into OneNote and access all of Class Notebook’s learning features.